I am not a dessert person really. But this bubur sumsum dessert, an Indonesian pudding made of rice flour, coconut milk and pandan leaves, is no hassle at all to make, and everyone really enjoys it so much at the end of their meal. The creamy, silky bubur has a soothing, smooth, pudding-like texture, and the special sweetness of the palm sugar, flavoured with pandan leaves, adds a perfect sweetness to its subtle and bland flavour. Indonesian children are lucky, it is not only a snack, they can even have it for breakfast. Poor Dutch kids – they are supposed to have healthy breakfasts with hearty rye bread and cheese, instead of sticky puddings! To make this, you will need (humble portion for 4): 50 grams of rice flour (I could only find this in the baby section of my supermarket, so there is a package with a smiling baby in my cupboard right now); 1 tin of coconut milk (400 mls); a pinch of salt (or 2) and 1 shredded pandan leaf. (You can buy frozen pandan leaves from the Oriental supermarket, so stock up on them). Put rice flour, coconut milk, pandan leaf and salt in a saucepan and whisk to combine. Bring slowly to the boil, keep stirring until it thickens. This will only take like 5 minutes, it has become a thick cream. You can now eat the bubur sumsum hot or cold; switch off the heat. It will solidify more if you let it cool. In a second saucepan, combine 8 tablespoons of palm sugar (dark brown sugar) with 4 tablespoons of water and (again) one pandan leaf. Heat until the sugar dissolves and turns into a syrupy sauce; let simmer slowly to have it take on the pandan flavour. 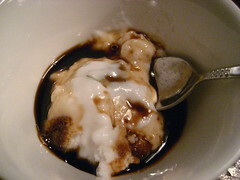 Divide the pudding into bowls and spoon over palm sugar syrup. Very special! Be careful, you can easily overeat… or you will rush to the shop to buy more tins of coconut milk to make it again the same day.